The Bouvier des Flandres or ‘Cattle Dog of Flanders’ originated in the low-lying areas of what is now Belgium and Holland. It is virtually impossible to pinpoint the breed's exact origins, but it probably evolved from the hardiest farm and country dogs. Modernisation of farm equipment has put a stop to the Bouvier’s original use as a working dog and nowadays serves principally as a guardian of farm and family or, in some countries, as a working service dog for the Police and Defence forces. A healthy female will usually weigh up to 27kg and stand 59cm tall, and the male should weigh up to 35kg and stand 68cm tall. The Bouvier des Flandres dog varies between being a natural clown capable of befriending almost anyone, and being a reserved, one-man dog. The way in which their personality develops depends very much on the amount of love and care provided. Ideally, they should be calm but alert companions with a tendency to become deeply attached to their family. 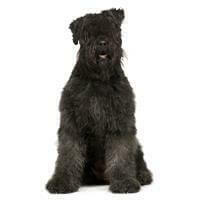 The Bouvier des Flandres has a dominant nature and likes to be ‘top dog’ in the home. Bouvier puppies adapt well to older dogs or cats in the home, but older Bouviers can be more difficult to integrate into a new home with existing pets. Bringing a new dog into the home after your Bouvier has ruled the roost for some time may lead to conflict, but careful obedience training will soon control this behaviour. The Bouvier des Flandres is a double-coated dog. It has an outer coat of rough and harsh hair and an undercoat of fine and close hairs. The shaggy coat of the Bouvier requires a great deal of maintenance to ensure that the loose hairs are not retained by the undercoat and it needs to be combed for a minimum of 30 minutes per week to prevent matting. The Bouvier Des Flandres makes an excellent companion provided owners can accept a dog with an independent nature. Due to its size, this breed is ideal for those people who can give it strong leadership and plenty of exercise.